Nearly half of all Europeans are genetically predisposed to obesity. The condition is a worldwide epidemic affecting more than half a billion people and rising every year in most countries. Despite this, we know little about the genetic origin of the condition and have no good medical treatment for it other than bariatric surgery. But now a genetic study seems to have cracked the mystery – raising hopes for more efficient treatment. The global obesity crisis is often blamed on an increasingly sedentary lifestyle and poor eating habits. However, studies have shown that 70-80% of the differences between people in body fat are due to their genes (this is called the heritability). The first large-scale genetic studies for obesity were launched in 2007, after the initial mapping of the human genome. And one gene, dubbed FTO, made the headlines by popping its head above the other 20,000 genes in the pack. For the past eight years, despite finding nearly 100 other genes linked to obesity, FTO and the area around it have remained the top signals. But scientists around the world have struggled to understand how the gene works and whether it really is behind obesity. A switch for fat burning? The new study, published in the New England Journal of Medicine by an international team of researchers, took seven years and cost more than a million dollars. It is based on a wide range of studies of hundreds of patients, cell types and laboratory mice. The researchers also mined a rich public resource of databases for gene expression as well as the heritable changes in gene expression (epigenetics), demonstrating just how complex this field has become. It turns out that the FTO gene doesn’t do much directly – it influences other nearby genes which cause the changes via regions in the DNA called enhancers and repressors. These can change the precursors of adult fat cells while they are still developing. All fat cells originally come from our bone marrow along with cartilage and bone cells and they pass through different stages as they become fat cells. 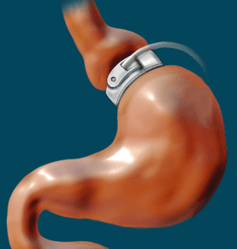 Could a simple pill replace invasive and expensive obesity treatments using adjustable gastric bands. We know from recent research there are different types of fat cells in humans, with the most common being white, then some beige and a few brown – each storing and burning fat differently. Obese people have a greater proportion of white cells, which stores the fat rather than burning it off (getting larger as a result). The susceptibility gene variant that the study uncovered makes people produce less brown and beige fat – although the natural effects are quite small. The team went on to block this pathway using a gene editing tool called CRISPR and found the effects on cells in culture and in lab mice were actually substantial: with five- to seven-fold effects on the animals’ ability to burn fat. In fact, blocking the pathway made the animals 50% thinner. The implications of this work are that after ten years of knowing about thousands of disease-related genes, we finally have the tools to crack the underlying mechanisms. By understanding how the body changes unhealthy white fat cells to healthy beige cells, we can start to develop new treatments for obesity. This work also emphasises that the billions of dollars spent on the Human Genome Project and its spinoffs such as ENCODE and Epigenetics Roadmap have not been wasted. But we have redefined the parameters of success. We know now that identifying genes for the most common diseases is actually pretty useless for prediction or diagnosis. Knowing all the 100 identified obesity genes only explains less than 5% of the genetic effect in an individual. Emerging fields such as epigenetics, metabolomics or microbiomics or the old fashioned way of looking at the health of your parents are much better for personalised medicine. But if you want to understand how to design a badly needed drug for obesity, gene based studies like this are the key. Full-scale research could start on drugs that increase the relative production of beige and brown fat. Hopefully, trials could be underway in humans within a decade.